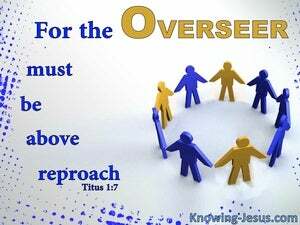 Because an overseer is God's servant manager, he must be blameless. He must not be arrogant or irritable. He must not drink too much, be a violent person, or make money in shameful ways. 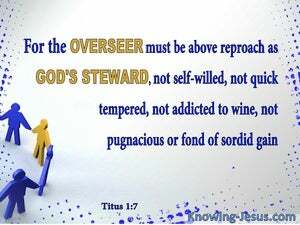 As God's manager [of the church], an overseer must be free from just blame, not a drunkard, not a fighter [and] not in love with money. for a bishop must be blameless, as the steward of God; not morose, not soon angry, not given to wine, not violent, not desirous of unlawful gain. For a bishop must be irreproachable, as steward of God; not self-sufficient, not prone to anger, not intemperate, not a striker, not occupied in sordid gain. For the overseer must be blameless as one entrusted with God's work, not arrogant, not prone to anger, not a drunkard, not violent, not greedy for gain.